Jorge L. Fors, Jorge L. Fors, Jr, and Adam S. Feldman. 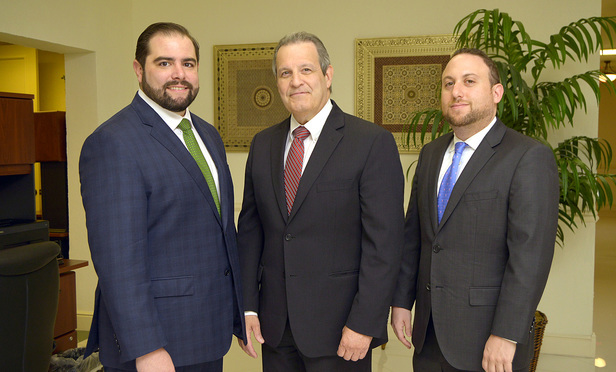 FORS trial attorneys won a $10.4 million verdict for a Doral business owner against alleged former partners who he claimed worked to destroy his company from the inside. As first written by Celia Ampel of Daily Business Review: Santiago Montilla, who owns the freight-forwarding company JAP Logistics Inc., filed suit after allegedly discovering his partners in a joint venture were withholding payments from suppliers and vendors. Montilla said he agreed to work with three principals of multinational logistics company Celistics Holdings S.L. to transport cellphones and cellphone accessories for Telefonica, one of the top wireless service providers in Europe. But after a joint venture agreement was made, he claimed, the three men created a mirror freight-forwarding company without him. They also started racking up JAP Logistics’ debts, paying them off only if the suppliers agreed never to work with Montilla or his company again, according to the lawsuit. “They decided to not only do this without him, but to destroy him and his business relationships before they left,” said Montilla’s attorney, Jorge Fors Jr. of Fors Attorneys at Law in Coral Gables. Fors tried the case with his father, Jorge Fors and Adam Feldman. Celistics’ three principals, Fernando Fiksman, Moris Beracha and Luis Otero, maintained they never had a joint venture agreement with JAP Logistics. The agreement, according to Montilla, was this: Fiksman, Beracha and Otero would acquire JAP Logistics through a company they controlled, Panamerics Ventures S.L. Then Celistics and the newly formed conglomerate would enter into a contract that made Panamerics/JAP Logistics the exclusive provider of freight-forwarding services for Celistics’ Telefonica shipments. Celistics already had a contract with Telefonica worth €70 million, or $78.5 million, to be the wireless company’s exclusive provider of logistics services in Latin America. At a three-week trial before Miami-Dade Circuit Judge Antonio Arzola, the defendants argued they only made a standard stock purchase agreement with JAP Logistics. They said they were looking into acquiring the company but never made a joint venture agreement. Plaintiffs counsel’s challenge was to show there was a joint venture agreement on top of the stock purchase, Fors said. Montilla’s lawyers argued the defendants’ conduct after the email was consistent with a joint venture agreement. Evidence showed Celistics employees were in control of payroll and paying JAP Logistics’ bills. After deliberating for four hours, the jury on Sept. 16 awarded Montilla about $10.4 million. The award included about $5.75 million for breach of fiduciary duty, $1.81 million for unpaid bills, $1 million for Montilla’s reliance on the defendants’ promises, $1 million for tortious interference, $872,000 for trade libel and $40,000 for breach of a consulting agreement. The award was reduced by about $92,000 because the jury found JAP Logistics received commissions from subcontractors for certain services to Celistics that it should not have received. The jury did not award damages on plaintiffs’ claims of fraud and conspiracy. After the trial, the parties reached a confidential settlement agreement, so the verdict will not be appealed. Beyond mentioning the settlement, defense lawyers Francis Sexton and James Gueits of Roig Lawyers in Miami declined to comment on the case.